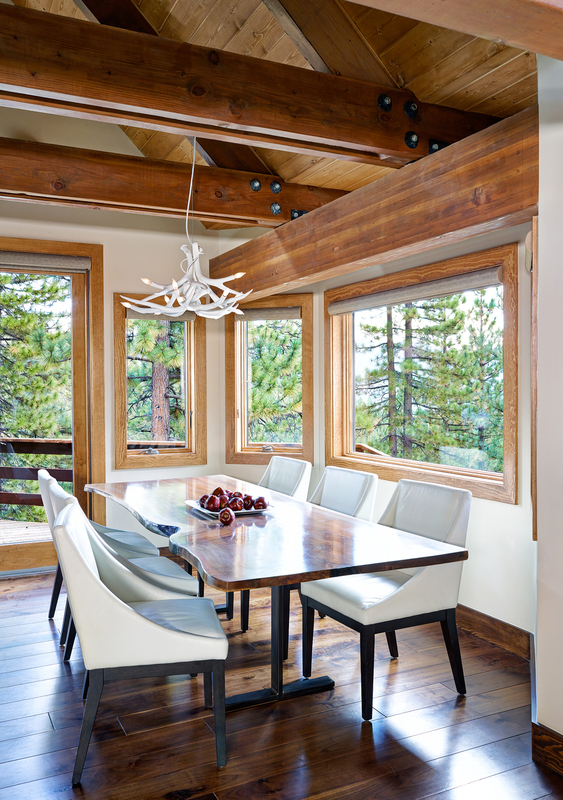 Situated beautifully on a forested slope with sweeping views of Lake Tahoe, the original design of this home did little to draw from these attributes. In conjunction with the owner, a highly regarded and skilled architect, SSB transformed the space from simplistic and predictable to sophisticated and elegant. We stripped the space to its frame, moved and added windows to maximize site lines, replaced the mechanical system with a modern high efficiency radiant boiler, installed a large open flame gas fireplace, and re-designed the lighting for both efficiency and improved ambience, making custom concealed fixtures to fit within the trusses. Other custom features include shou-sugi-ban entry door, built-in cabinetry, floating shelves, stair rail, and ancient local juniper slab vanity. Engineered hard wood floors were installed above radiant floors. Custom tile features throughout. This home felt closed and cramped until this very thoughtful remodel and we are proud to showcase it here.